Regarding involvement of Mayawati in the matter, the Lokayukta said there was no evidence. dedication and she never gave any order. If you understand the technology behind video production, and enjoy the process of taking raw video footage and creating a video that flows, a video production business may be a great small business idea for you. • You can provide a full range of video services, including editing, producing, adding special effects, digitizing, etc. • Your business can be home-based, or you can have a physical location. • You can even offer a mobile service, going “on location” for clients and completing editing projects from your home office. • You can partner with videographers, photographers and party planners for increased business. • You can get started using the broad range of free editing software before “graduating” to the more professional options. • The earning potential is high, once you become established. • You need extensive skill and experience in all things related to video production. • You need to purchase the necessary equipment, which can be very expensive. • You will need a designated spot to store your equipment. • Your business may be limited to your geographic area, so you will need to maximize local advertising. • There may be significant liability because you will be handling your clients’ original, potentially valuable videos. Your video editing business might play a variety of roles. You could start by recording and editing small to mid-size parties throughout your community. Alternatively, you might focus on editing existing tapes–for instance, by adding sound effects, mixing scenes, or including titles and transitions. Designate enough time to complete projects, particularly if you begin the business on a part-time basis. ◦ 1 Decide what type of editing business you want to establish. Video editors usually evaluate and sort scenes, while sound effect editors enhance films by recording necessary sounds or getting existing sounds from appropriate sources. Music editors improve background music, such as by synchronizing music tracks with the film. ◦ 2 Purchase appropriate equipment and software like Adobe’s Premiere Pro CS4, which supports many cutting-edge effects. Free video editing programs exist, such as VideoSpin, Microsoft’s Movie Maker, or Apple’s IMovie, if your budget is limited initially. ▪ Accelerate your Startup Incubation, Mentoring and Funding For your Startup, Join Today! ◦ 3 Price your services reasonably by researching what your local market currently supports. Decide whether you will charge a flat fee of, say, $250, or an hourly rate of maybe $50. You might give free consultations and determine separate prices for each project. ◦ 4 Advertise continuously by creating business cards and fliers and placing them at strategic locations. Always carry a set of business cards so that you can quickly provide information to potential clients. Establish a basic website that identifies your services and includes a few examples of your specialties. ◦ 5 Designate a location in your home to support all of your equipment. Use a space consistently, like a spare room or a garage, as your office. Carefully organize business-related revenues and expenses, which you likely will have to report on your federal tax return. • Consider developing a simple design to place on vehicles such as the designated business van, or even a family member’s personal vehicle. Make sure that the design clearly states your contact information, especially your phone number and website. • While free programs might seem to be a great deal, they often do not have great quality. Initially practice using free software, and gradually buy better products to upgrade to cutting-edge technology. By following some simple rules for video editing you can make your movies flow together smoothly, in a classic style, without resorting to multiple transitions. Of course, rules were made to be broken and creative editors take extreme artistic license. But, if you are new to the craft of video editing, learn these rules and consider them a foundation from which to develop your skills. These clips can be used to cover any cuts, or smooth trasitions from one scene to another. action or direction of focus. 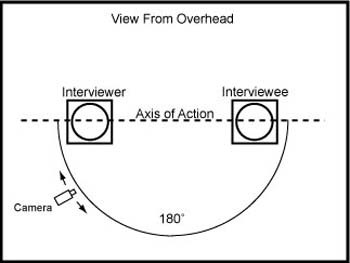 axis of action and maintain consistency of screen direction. moving shot that shows the crossing of the axis of action. that a shot is a “Reverse Angle” as is done in sporting events. You can do the same thing in your videos. Cut from a flower on a wedding cake to the groom’s boutenier, or tilt up to the blue sky from one scene and then down from the sky to a different scene. The regulation left several core terms undefined and the intent unclear. If we take David Jefferson’s statement as reflective of the Secretary’s goal, this regulation should have been clarified to support the evaluation of the verification software. The regulatory intent here was to ensure that the disabled voter or an organization representing the disabled voters could obtain and inspect the source code of the verification subsystem. They would want to exhaustively inspect the code to make sure that it was accurately verifying the vote from reading the printout or interpreting the signals sent to the printer to produce the printout. The Secretary’s decision to require that the source code of this subsystem be open source is logical; however, a clear definition of “open source'’ is necessary for vendors to build such a system. For example, they will need strict control of what pieces of their intellectual property is included in this piece of software. The Secretary should have aligned the regulatory intent of the AVVPAT order with licensing requirements to establish some minimal licensing criteria for this “open source'’ software.54Then, with a minimal set of licensing requirements, a few representative open source licenses could be chosen and offered as valid licenses under which to develop verification code. This level of detail was not included. In January of 2005 this requirement was implicitly revoked by new regulations that omitted it.55This could have been an interesting experiment in regulatory push of open source; however it seems instead that it was destined to fail without sufficient attention to the issues raised above.